Maximum package, 500GB bandwidth. 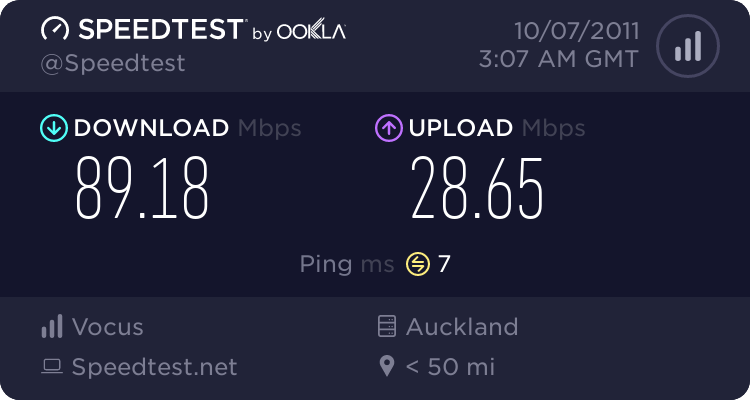 We use to get AMAZING speeds, just lately, over the past 3 days, I can barely hold a Skype call with my girlfriend which is currently in America. She can't even hear me, and it's even worse if the webcams are on. Have you checked the wiring in your house?? If you email me pl at telecom dot co dot nz I can run a line test... but I would put fair money on the fact you would need a Master Filter. Well, telecom already ran a line test, and it seemed fine. Masterfilter? it's been running fine up until now. Could be a line fault. Try an isolation test first (search this forum to find what an isolation test is). Natha: Well, telecom already ran a line test, and it seemed fine. Masterfilter? it's been running fine up until now. And thats the point, if you dont have a master filter you have the ability to unknowingly screw with the DSL signal by some seemingly harmless plugging in of a phone device. Zeon: Could be a line fault. Try an isolation test first (search this forum to find what an isolation test is). Thanks. I disconnected every single connection to the line in the house, besides the modem, rebooted, and it's still the same results. What are your modem DSL line stats, and approx where are you located? RunningMan: What are your modem DSL line stats, and approx where are you located? I'm guessing line stats, you mean ASDL2+? Well if so, it's ASDL2+. I'm located in Auckland, Botany. How many people share the internet connection? Sounds like someone has torrents running..
JamesL: How many people share the internet connection? That's the weird thing. When I took the test. I'm the only one home. I don't use torrents. Nothing is downloading. My laptop is the only laptop on, and even after a reboot, it still remains. Still waiting for that email to me with your home phone line so then I can say it's a problem with your wiring. Not quite, but close. You'll need to log on to your modem, and see what the connection stats are for the DSL connection. Should be a couple of sync rates, attenuation, and noise margin. plambrechtsen: Still waiting for that email to me with your home phone line so then I can say it's a problem with your wiring. Given it's a laptop, are you using WiFi or ethernet (wired) connection to your modem? If using WiFi, stop, then try wired before doing anything else.